Keith Lamarr Hamilton was born May 25, 1971 in Paterson. Patricia and Willie Lee Hamilton had an older son, Jarrod. Violence in their Paterson neighborhood convinced the Hamiltons to move to Patricia’s hometown of Lynchburg, Virginia when Keith was three years old. He and his brother fished and camped and later hunted. They also excelled in sports. Keith grew to 6’3” and excelled in baseball, basketball, football and track. Their father was a supervisor in a foundry who used a strap to discipline his boys. When Keith was 14, his mother had a daughter, Rhyan. Keith became a standout in four sports at Lynchburg Heritage High, and was the star of the Pioneers football team. 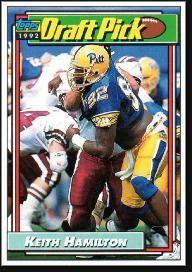 He accepted a scholarship from the University of Pittsburgh in 1989. His father died while he was in college, and Keith took on fatherly responsibilities for Rhyan. Keith played defensive tackle for the Panthers on a line that, year in and year out, proved to be the team’s great strength. The 1989 team ranked in the Top 20. The 1991 team finished 6–5. Keith and fellow defensive tackle Sean Gilbert led the defense, and both were drafted in 1992 (Keith decided to forego his senior year). The New York Giants took Keith in the fourth round. Keith’s aggressive play earned him the nickname The Hammer, as well as a starting job at left defensive end in his second season. That year, he recorded 11.5 sacks to lead the team. In 1994, he tied for the team lead with 6.5 sacks, recovered three fumbles and produced a safety. In 1996, he moved to right defensive tackle, with Michael Strahan taking over at defensive end.